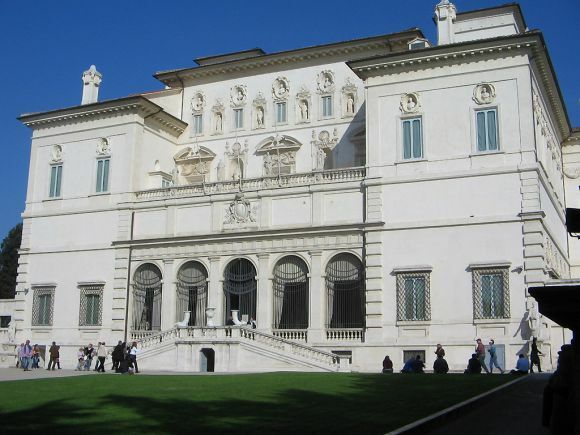 The Borghese Gallery is one of the seven museums under the Soprintendenza per il Patrimonio storico artistico ed etnoantropologico e per il Polo museale della città di Roma (Superintendence for the historical, artistic and ethno-anthropological heritage and the museums of Rome). The palace was built in the 17th century by the architects Ponzio and Vasanzio inside the largest park in Rome and was intended to provide a suburban villa and accommodate Cardinal Scipione Borghese’s passion for collecting. A kind of museum before the term existed, it houses one of the most enchanting collections of art in the world, with works by Raphael, Titian, Caravaggio, Lanfranco, Domenichino, Gian Lorenzo Bernini and Canova, the 18th-century room in Egyptian style and even a huge collection of Roman sculptures, ancient mosaics as well as precious wood furnishings. The origin of the collection stemmed from Scipione’s interest in antique and classical art and his desire to exalt the nobility of his family, but later it was enriched with gifts and acquisitions. In particular, in 1607, through the requisition of the paintings from Cavalier d’Arpino workshop and the acquisition of Della Porta and Ceuli collections, the cardinal took possession of dozen of works of art; in 1608 he bought 71 extraordinary paintings belonging to Cardinal Sfondrato, including the famous Amor sacro, Amor profano by Titian. At the end of 1700s Marco Antonio IV Borghese entrusted Antonio Asprucci to launch a radical renovation that followed the modern criteria of the neoclassical style. In 1805 Camillo Borghese commissioned the sculptor Canova to portray Pauline Bonaparte as a Venus Victrix. A serious loss was sustained in 1807, when over 695 works were sold to Napoleon and moved to the Louvre in Paris. Since 1833 a trust forbade any other dispersal until 1902, when the Galleria Borghese was acquired by the Italian state.